David F. Myrick, whose roots went deep into local lore, is gone now, but his two monumental books about the transition of sleepy Santa Barbara and Montecito into regions of great estates are lasting legacies to our history. Myrick, who died September 24 at age 93, was a widely respected writer and researcher who chronicled not only the bricks and marble of the grand estates but also colorful stories about those who built them. “It’s quite a legacy that he left,” said Michael Redmon, director of research at the Santa Barbara Historical Museum and the author of this paper’s History 101 column. 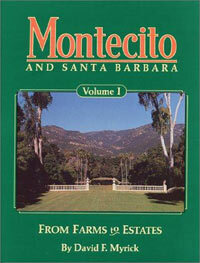 Myrick’s two-volume Montecito and Santa Barbara tells in rich detail, with dozens of vintage photos, how this corner of California changed from a dusty seaside town to a mecca for the wealthy. I knew David as a gentle, soft-spoken man with a twinkle in his eye and a story on his lips. “He was somewhat of a modest man,” recalled Redmon. “He did what he did for organizations quietly, behind the scenes. He was a marvelous researcher. His two Montecito and Santa Barbara volumes are always the most-used books in our collection. We’re very fortunate to have our community documented as he did.” Myrick also contributed to the Historical Museum’s publication Noticias. Santa Barbara High’s Peabody Stadium was financed by Arrow Collar magnate Frederick Forrest Peabody. David Gray, who got rich in the fledgling auto industry, wanted to ensure that East Beach was preserved for public recreation. He paid not only for the East Beach Pavilion but, when the city had no funds to furnish it, paid for that as well, plus money for five years of operating funds and maintenance. Gray also joined Peabody and others in a deal to hold land along East Cabrillo Boulevard until the city could buy it for park land. Yeast king Max Fleischmann, a yacht owner, paid to extend the breakwater and was a major donor to Cottage Hospital and the Museum of Natural History. Myrick was known to lament that the later wave of wealthy newcomers did not all share the need to be philanthropists. Myrick’s two Santa Barbara histories end at 1940, perhaps to signify that an era had ended. Unknown to many of his admirers, Myrick’s great love was writing about railroads of the West. His books include Railroads of Nevada and Eastern California, published by Howell-North Books, and which won an Award of Merit from the American Association for State and Local History. David attended Crane Country Day School and Santa Barbara State College before earning a degree at Babson College in Boston. He absorbed a love of the written word from his journalist father, Donald, who was an editor at the Daily Princetonian, then a reporter for the Los Angeles Evening Express, and later business manager for the Santa Barbara Morning Press. In all, Myrick authored an estimated 140 articles and 17 books. Somehow he tore himself away from his desk to participate in countless organizations, including the Santa Barbara Historical Museum and the Montecito Association.